Earthrise, taken by Bill Anders on Apollo 8.
media. Nope, the 'sin' of reading the Bible in public has a long and storied history, and there is no more interesting chapter than what happened 45 years ago today. 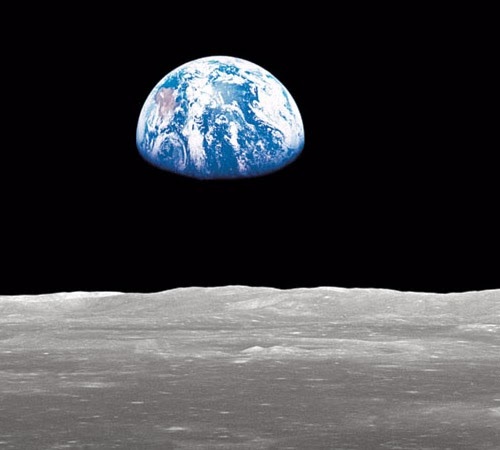 The 3-astronaut crew of Apollo 8 — Commander Frank Borman, Command Module Pilot James "Jim" Lovell, and Lunar Module Pilot William "Bill" Anders — became the first humans to travel beyond low Earth orbit, the first to see Earth as a whole planet, and then the first to directly see the far side of the Moon. And, boy, did they get in hot water over it. Madalyn Murray O'Hair, a militant atheist, responded by suing the United States government (specifically, the NASA administrator), alleging violations of the First Amendment.The suit (O'Hair v. Paine, 397 U.S. 531 1970) was dismissed by the Supreme Court due to lack of jurisdiction. UPDATE: Lovell recreates the transmission this year.